High-performance pogo stick featuring a unique patented air-spring. Crafted from exceptionally strong, aerospace grade materials. Assembled in the USA. Dimensions (in packaging): 41" x 14" x 4"
Like the hula hoop, the pogo stick is one of those childhood toys that brings out the kids in us. Just pure, classic fun. But if you’ve ever tried a basic pogo stick, you know all too well that bouncing off the ground even just an inch or two takes tons of effort. 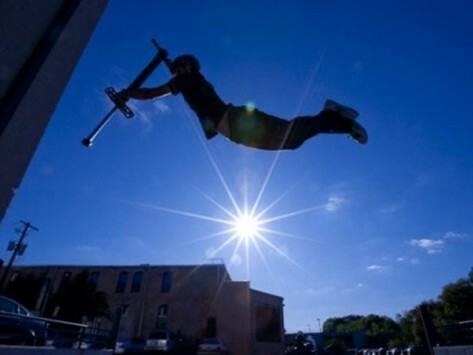 With their steel-spring construction, traditional pogo sticks aren’t really all that bouncy. Rubber-band cores give a little more oomph to newer models, but the really big bounce still eludes most jumpers. We big kids — and little ones with lofty hops in mind — need a super-powered pogo stick. The Vurtego, which uses a patented air-spring propulsion system, unleashes the big bounce. In the hands of a master jumper (none of us here qualify…yet), this puppy can soar as high as eight feet in the air. Bruce Spencer, the 65-year-old inventor, gets a good four feet out of his Vurtego. He jumps every day, proclaiming the health benefits: improving circulation, building bone density and reducing body fat. His son Brian, company co-founder, just likes to have fun. 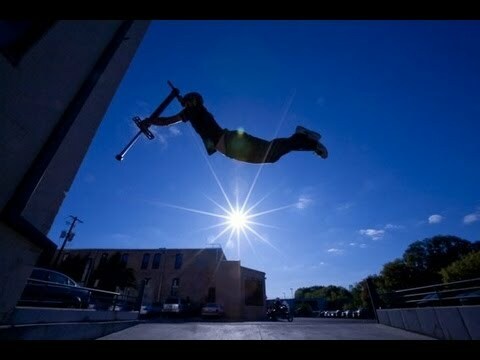 Brian calls pogo sticking a new fuel-free urban sport and has an eight-foot jump on record. (Don’t worry, you can adjust the tension if you don’t want to soar to such heights.) Ready for a ride, anyone?